Get a great price on the SMOK Skyhook RDTA from Vapor DNA. 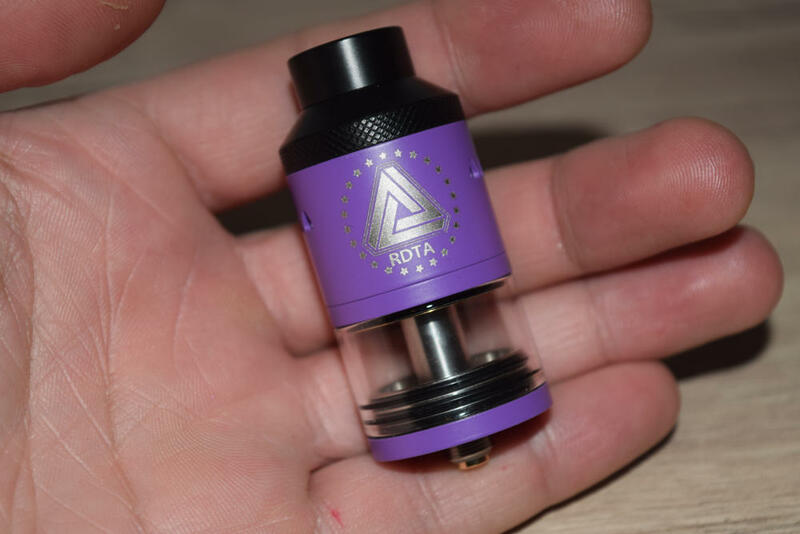 RDTA’s are really popular these days, so much so that it seems like everybody and their sister is coming up with one just so they can grab a piece of the pie. 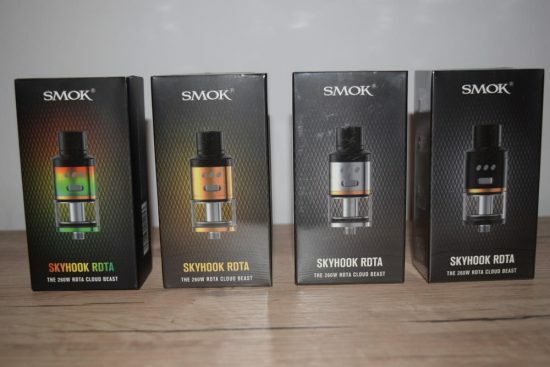 The latest player to join the party is SMOK, which has recently launched the Skyhook RDTA, an intriguing atomizer featuring both side and bottom airflow, 5 ml e-liquid capacity and the possibility to be converted into an RDA. 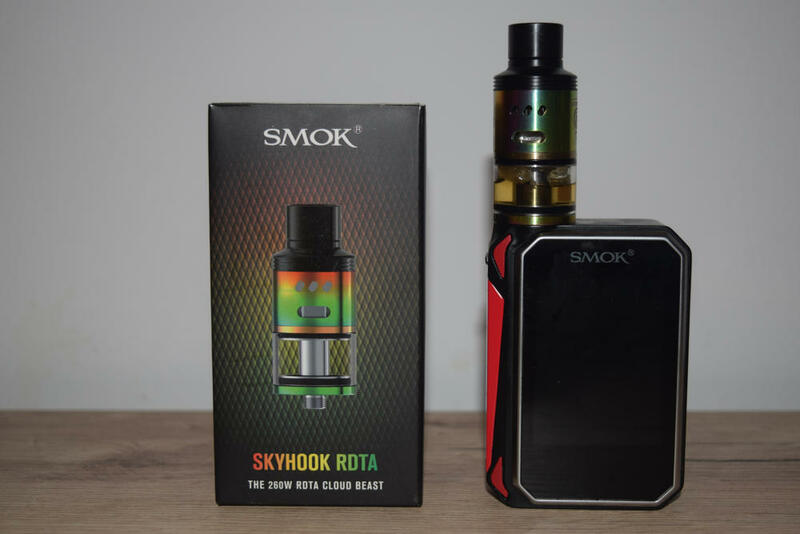 In this review, we’ll be taking a close look at the Skyhook and determine if it’s a worthy competitor to popular RDTAs like the iJoy Combo RDTA and the Limitless RDTA Classic. 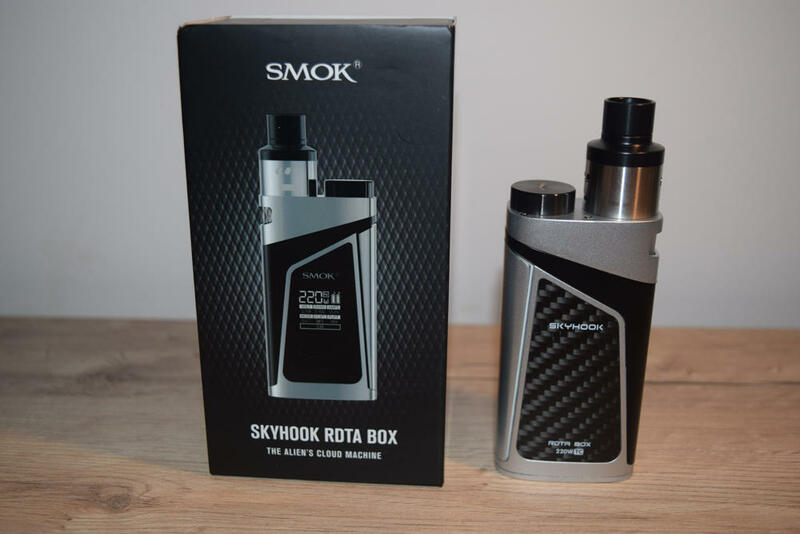 The Skyhook RDTA comes in the classic SMOK packaging – a black rectangular cardboard box with a thick paper wrapper featuring all the necessary information (product description, warnings & legal disclaimers, pictograms, and authenticity scratch code). Now, this is a SMOK product, so even before opening the box, I expected the contents to be very generous. I wasn’t disappointed, as the Skyhook RDTA comes with loads of accessories and spare parts. 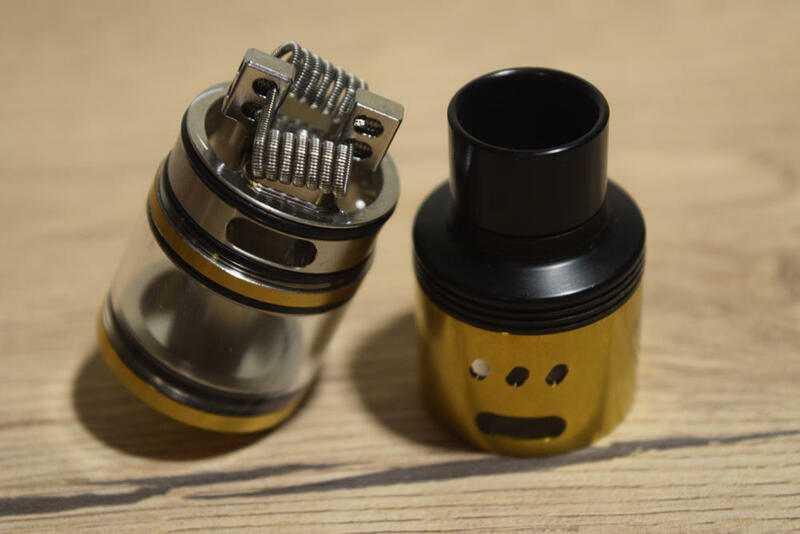 Apart from the pre-assembled tank itself, we have a spare glass tank, an extra RDA barrel, loads of cotton, an RDA base, an adapter for single-coil vaping, spare o-rings and grub screws, and an Allen key. This is what you’d call a truly complete RDTA starter kit. The only thing I found confusing at first glance was the “The 260W RDTA Cloud Beast” description on the front of the box. It didn’t really make any sense to me, since this thing can be used at virtually any wattage, depending on what you build you have installed. They may be referring to the pre-installed fused Clapton coils, but it’s still confusing. At first glance , the SMOK Skyhook RDTA doesn’t have a groundbreaking design. It has the classic conical shape, with the atomization chamber sitting on top of a 5 ml juice tank. It comes with a wide diameter Delrin drip tip that does NOT have a 510 connection. Unfortunately, the kit doesn’t include a drip tip adapter either, so if you want to use your favorite 510 tip, you won’t be able to. The Skyhook is 24.5 mm in diameter and measures 61.5 mm from the base to the tip of the drip tip. That makes it 0.5 mm narrower than the Combo RDTA and the Limitless, as well as a couple of millimeters shorter. 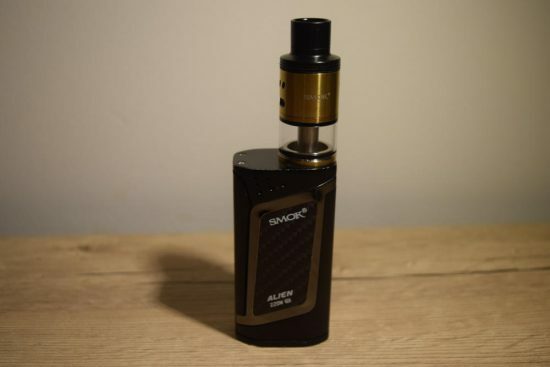 It’s still a big boy, though, so if you’re looking for an RDTA to look good on a smaller device, like the Eleaf iStick Pico 75W, this probably isn’t for you. The first thing that stands out about the Skyhook RDTA is the dual airflow system on the RDA barrel covering the build deck. The are two massive slots near the bottom of the barrel – one on each side – and three smaller holes located near the top of the barrel, also on both sides. This is basically what sets the SMOK Skyhook apart from all other RDTAs that I’ve used so far – it features both bottom and side airflow, which can be used alternatively, or at the same time. That’s a very big deal in my book, as this tank can theoretically meet the needs of both cloud chasers, and flavor junkies looking for a versatile device. 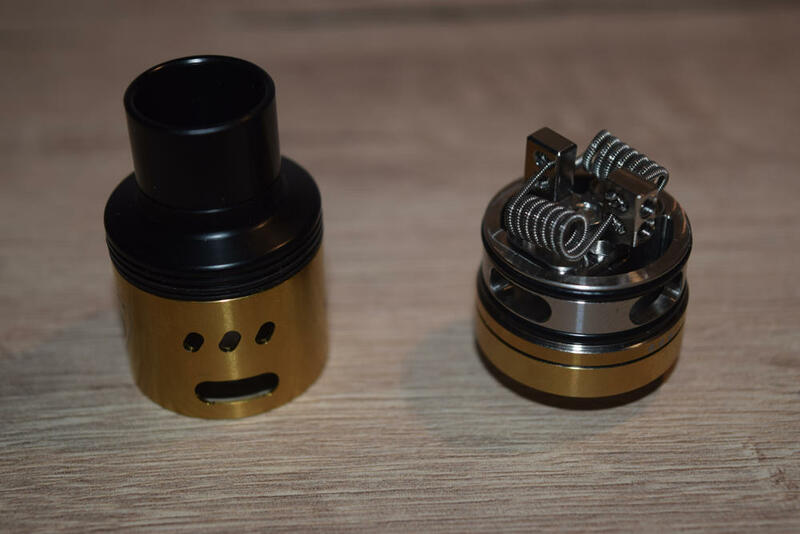 The build deck features two floating velocity posts with large-diameter slots that will most likely fit whatever wire you prefer, as well as a couple of unusually large wicking slots. This can be considered both a con and a pro, depending on how experienced you are at wicking Genesis-style atomizers. If you use too little or thinned-out cotton, tilting, or turning the Skyhook upside down will most likely result in a big mess, with juice making its way into the atomization chamber and leaking through the many holes, but if you use plenty of it to try and fill the massive wicking slots, you’ll be able to avoid leaks and avoid dry hits as well. These wicking slots are so big that regardless of how much cotton you use, your leads will always be nice and saturated. 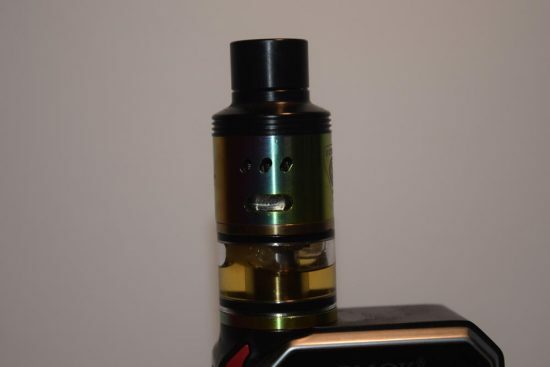 I’ve heard some people complain about the size of the wicking slots, and, to be honest, they do open up the risk of leaking, but if you wick them properly and have plenty of juice in the tank, they actually prevent dry hits. I for one love the wicking system of the Skyhook and have had no leaking problems whatsoever. The deck also features large bottom airflow slots on each side, positioned right under the coils, so if you love great flavor, these are going to offer a great vaping experience. Just make sure that the coils don’t come into contact with the slightly raised edges of these slots, or you’re going to get a short circuit. 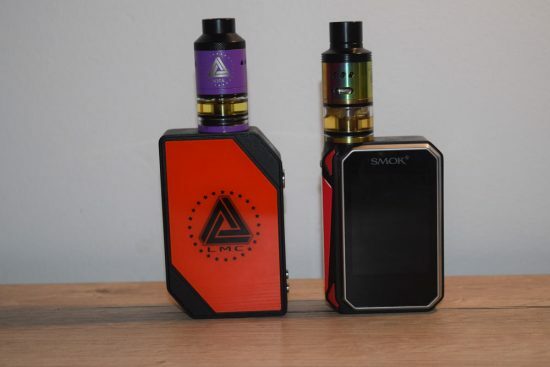 On their website, SMOK claim that the Skyhook RDTA features interchangeable build decks, which was most likely inspired by iJoy’s design, but in this case, it’s not just the deck that has to be swapped out, but the metal ring surrounding it, as well. That’s because the deck and the ring (which house the fill port and bottom airflow slots) are fused together. I definitely see this interchangeable deck system as a pro, as a lot of vapers have had enough of Velocity decks and are looking for something new to try. iJoy, for example, has Goon-style decks and even postless decks, so SMOK can come up with different designs too. 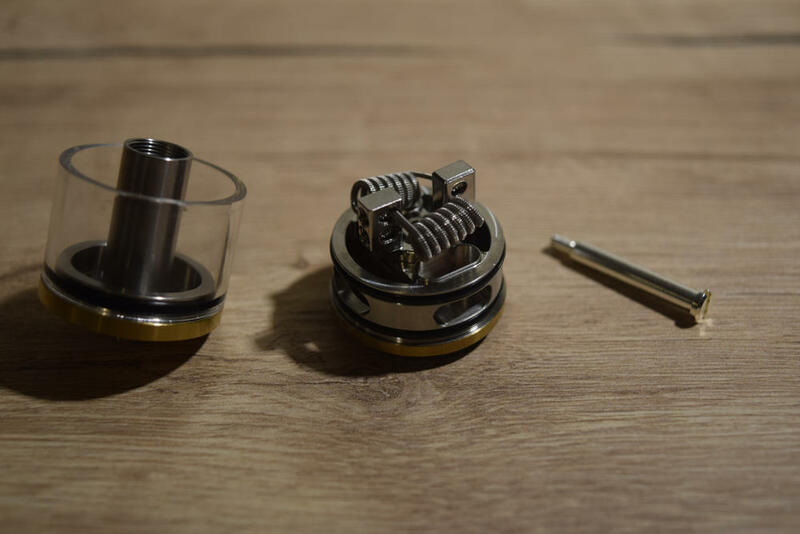 Another note-worthy feature of the SMOK Skyhook RDTA, which was again inspired by the design of iJoy’s Combo and Limitless RDTAs, is the possibility to convert it into an RDA, by removing the glass tank part. The cool thing about this RDA is that it retains the dual-airflow system of the RDTA, so you can enjoy side airflow, bottom airflow, or both. It also has a relatively deep well, so as long as you drip enough e-liquid in it, you don’t have to worry about the cotton getting dry after just a couple of draws. However, what I didn’t like about this RDTA/RDA system was that it’s a bit complicated to switch from one to the other. On iJoy RDTAs, for example, all you have to do is unscrew the deck and mount it on the RDA base, but the SMOK Skyhook actually has two 510 connections stacked on top of each other, meaning that you have to first unscrew the long 510 pin at the base, and only then unscrew the deck from the long post sticking out of the glass tank. 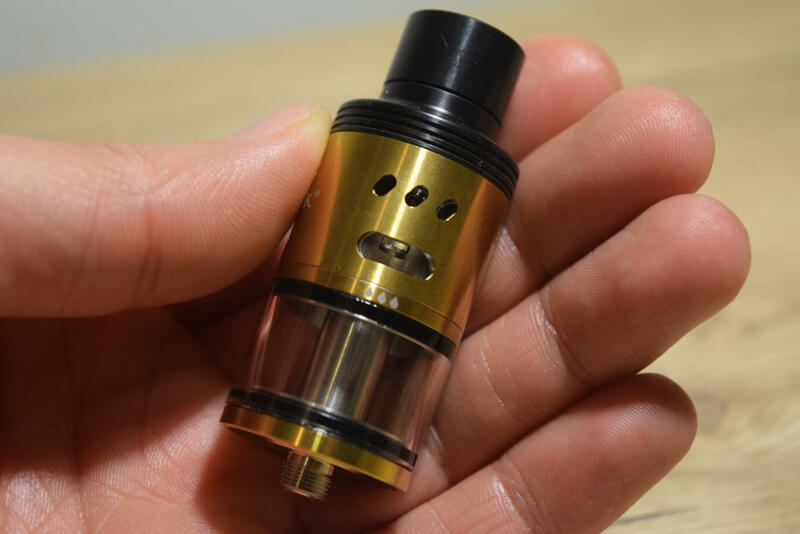 If you’ve had the pleasure of using the iJoy Combo or Limitless RDTAs, you’ll figure out what to do very quickly, but beginners might have some problems figuring it out. As always, the first thing you want to do is clean the tank thoroughly before using it the first time. Once that’s over with, make sure it’s as dry as possible before wicking it. I’m going to jump right to the wicking in this review, as the Velocity-style deck doesn’t really pose any challenge, and the Skyhook actually comes with two massive fused Clapton coils (mine are 0.28Ω). They’re not the best coils I’ve ever seen, but unless you’re really picky about your builds, they work just fine. But, whatever wire you plan on using, the massive post holes are almost certainly not going to be a problem. Usually, I’m very careful to use just enough cotton for my wicks to isolate the atomization chamber, while making sure that the e-liquid can easily saturate the cotton. In this case, the massive wick slots make it easy for the juice to travel to the coils, so you can actually use a bit more cotton to make sure they’re sealed up and the juice doesn’t just pour into the chamber when you tilt your device. I personally like to cut my leads right at the bottom of the metal barrel of the RDTA, so that they are not visible in the glass tank. You can definitely leave them longer than that, if you prefer, but I found that shorter cotton leads actually wick a lot better than shorter ones. Ultimately, it’s a question of preference, I guess. Once the wicks are in place, it’s time to fill up the tank, which I think is the Achilles’ heel of the SMOK Skyhook RDTA. I’ve actually had a couple of problems when filling this thing. The first one was partly my fault for not paying attention to the markings on the tank. When you remove the barrel to expose the metal ring surrounding the deck, where your fill port is located, you actually have three identical holes, two of which are bottom airflow slots. The fill port is marked with three little drops, but if you’re not careful, you can definitely mistake one of the airflow slots for it. At least that’s what happened to me the second time I tried to fill it. I just kept pumping juice into it and it spilled all over my beautiful SMOK G-Priv mod. I should have been more careful, but SMOK could have at least made the fill port a bit different than the bottom airflow slots, just to make sure people like me didn’t get them mixed up. The second issue with the filling is just bad design. Because the metal ring is fused to the build deck, the fill port is always on the same side of the deck, right where two of the cotton leads go into the tank. This really makes filling frustrating. 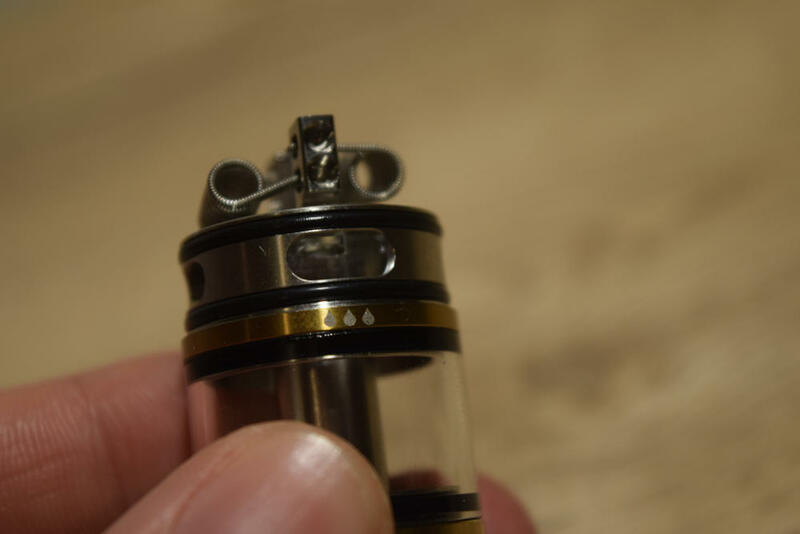 With iJoy RDTAs, you can turn the metal ring so that you don’t runt into this problem, but this one is fused to the deck, so it’s not possible. All you can do is use something like the Allan key to move the wicks out of the way when refilling the Skyhook. The cotton moves when you tilt the tank, so you’ll likely have to do this every time you have to add juice. It’s not a deal breaker, but the issue could have easily been avoided. When setting up the SMOK Skyhook in RDA mode, it’s basically the same as with the RDTA, because you’re using the same deck. The only thing you have to do is trim the leads a lot shorter, so they fit in the juice well. Filling issues aside, the Skyhook RDTA is a solid piece of vaping equipment. The vapor production you get with this thing is simply insane. I’ve only been using it at around 90W, and although it can handle a lot more power, it’s more than enough for me. I would go as far as to call this thing the new Cloud Beast, even though that tank wasn’t half bad either. But the Skyhook does actually produce considerably more vapor – if you can believe that – thanks primarily to its superior airflow system. I’m not into ‘cloud chasing’, but judging by all the atomizers I’ve used in the last five years, I can definitely see the Skyhook being used in competitions. The vapor it chugs is absolutely insane! As long as you’re using a serious build – those pre-installed Claptons will do – the SMOK Skyhook produces an impressive amount of vapor regardless of what airflow option you go for, but there are some small differences. I got the most vapor when leaving both the bottom and side airflow slots wide open, but the vape just feels way to airy that way, plus, you can only get short draws, because your lungs fill up almost instantly. The second best option for huge, dense clouds is using the side airflow only. 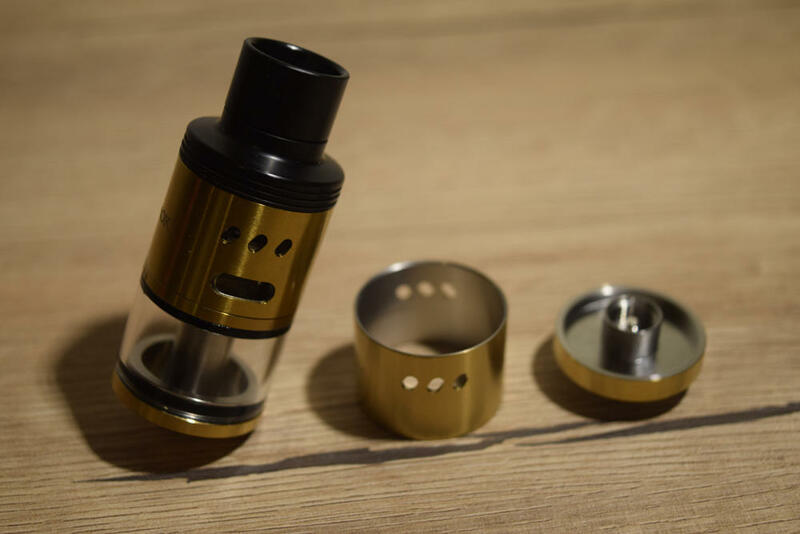 However, to use this particular option, you need to change the RDTA barrel with the spare one included in the starter kit. Because both the side and bottom airflow holes are located on the same side of the pre-installed barrel, rotating it to close off the bottom airflow leaves the side slots facing the deck posts instead of the coils. 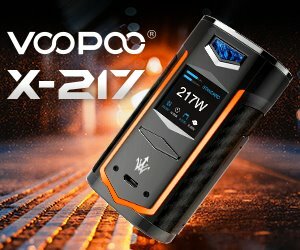 So SMOK decided to use a separate barrel to be used exclusively for side airflow. It’s a actually a very nice solution, as changing the barrels is both quick and easy. Finally, the bottom airflow produces the least amount of vapor, but the flavor is undoubtedly the best of all the three options available. The air hits the coils from underneath and just pushes the flavor right into your mouth. But don’t think that the vapor production is significantly inferior in this mode. It actually puts out more vapor than most of my other atomizers, it’s just slightly less than the two previous two options. The flavor boost is more than worth it, though. As I mentioned before, I’ve had no leaking issues with the SMOK Skyhook, but if there’s anything to complain about, it’s the juice consumption. You’ll chug some massive clouds with it, but you have to be aware that you’re paying for them in e-liquid. At 90W, I can literally go through a full 5 ml of juice in just a few minutes, when chain vaping. I don’t recommend it, though, especially if you’re still vaping nicotine-containing e-liquid. It’s really thirsty, but I’ve come to expect that from advanced SMOK tanks. Would I buy the SMOK Skyhook as my first RDTA? Luckily I don’t have to, but yes, definitely. Despite its notable design flaws, it’s a surprisingly versatile tank that meets the demands of both cloud chasers and flavor junkies. 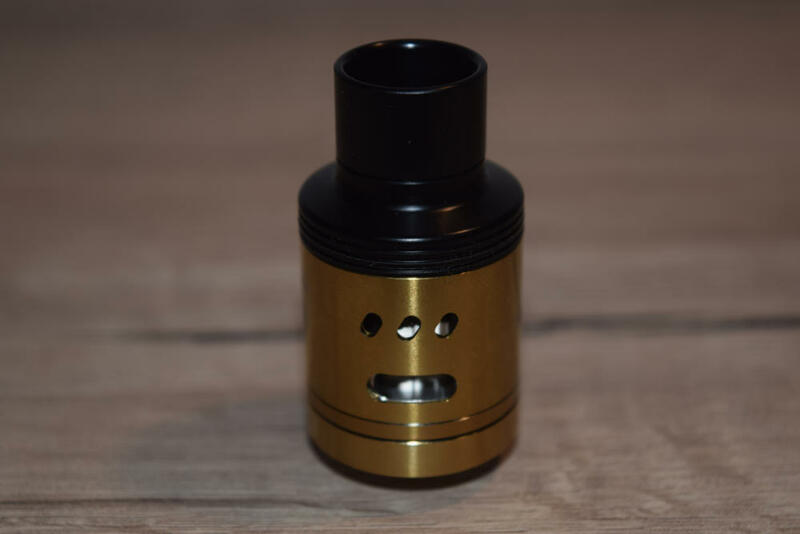 It comes with loads of accessories, it can be used as and RDA, and the airflow options are unlike anything I’ve ever used before. Would I buy it if I already owned something like the iJoy Combo RDTA or the Limitless RDTA Classic Edition? Probably, yes. 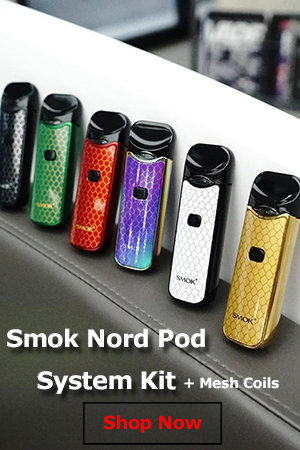 It depends on your budget, and how highly you values the significanly superior airflow of the SMOK Skyhook. Those other RDTAs are two of my favorite, and ultimately it comes down to personal preference. 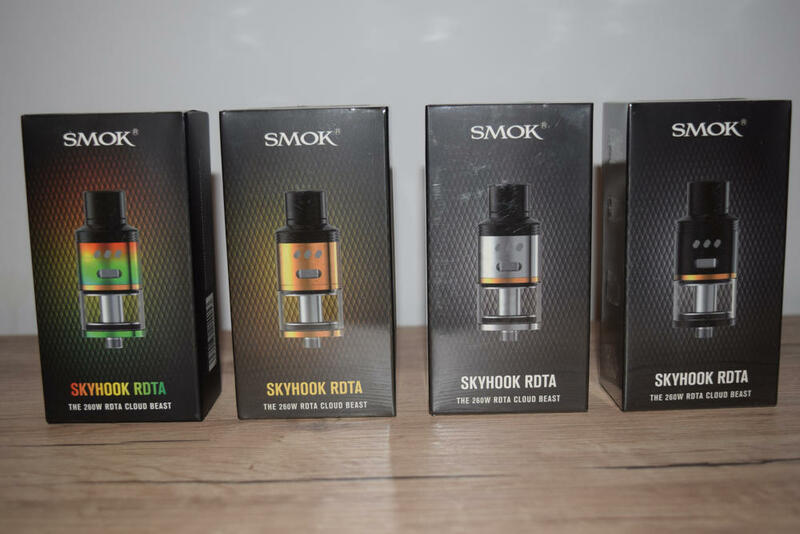 Overall, I’d say the SMOK Skyhook is a nice addition to my growing collection of RDTAs, and I strongly recommend you try it out if you get the chance.